Parking Lot Lighting, Parking Lot Light Poles & Fixtures. A potential customer's experience begins and ends in the parking lot. If the parking lot is not lighted and secure, especially at nighttime, patrons will not stop, park or shop. That's why major businesses make certain that nothing prevents possible shoppers from entering their stores. Parking lot lights solve this problem by bringing security through visibility to sidewalks, parking lots, streets, parks and many other applications that could benefit from outdoor lighting and light poles. Our series of commercial parking lot lights are constructed of formed aluminum that brings a contemporary look and feel to your business or commercial warehouse. All lighting fixture seams are welded and silicone sealed for a weather tight seal allowing these outdoor light fixtures to stand up to the worst weather. Conveniently outfitted with a hinged door for easy access, these light fixtures are flexible enough to be mounted on walls as well as parking lot poles. 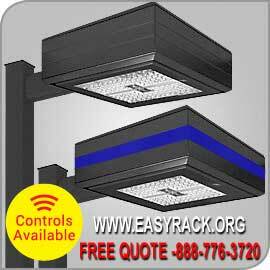 Add this to the variety of optics and accessories available and the Easy Rack parking lot light series is the best place to start when looking for parking lot lighting and security light fixtures. Concrete Light Poles. If you are an architect, lighting design specialist, or civil engineer in charge of proposing a parking lot lighting system, consider the many benefits the concrete light poles can equip you to pass on to your clients. Commercial & Industrial lighting poles are engineered to withstand high velocity winds, composed of the best carbon steel, and finished with thermosetting, polyester powder coating. Commercial Light Posts. From an aesthetic point of view, there are a number of different designs of commercial light posts available to suit your particular tastes and fit in with the rest of your business premises. Commercial light poles are designed and built to the highest standards, and come in a wide variety of styles and sizes in order to ensure that your exact lighting needs can be met every time. Car Parking Lot Lighting Fixtures. Businesses and municipal entities with outdated parking lot lights and poles face a number of problems that can result from poor distribution of light, inferior build and manufacture, and short lamp life. A potential customer's experience begins and ends in the parking lot. If the parking lot is not lighted and secure, especially at nighttime, patrons will not stop, park or shop.